As I get older, it happens more often. That terrible moment when you learn that someone is about to join the Champions Tour and you wonder where 30 years went. 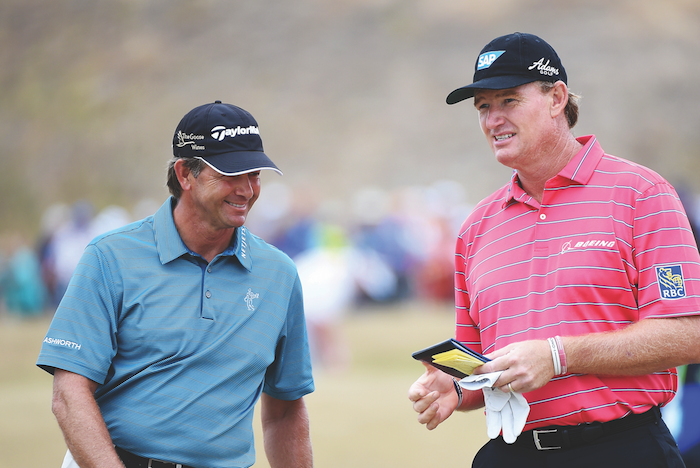 Ernie Els will be 50 on 17 October this year, and Retief Goosen is already there having reached his half-century on 3 February. When I first arrived in South Africa, ‘the Goose’ had just qualified for the European Tour by winning the 1992 Tour School in Spain. Ernie, always the more precocious of the two, already had a top 10 at a Major by then, coming fifth at the same year’s Open Championship at Muirfield; Nick Faldo won. But in my mind, and I guess I am not alone in this, Ernie and the Goose will always be in their mid-twenties, the former ambling into the crowd for a chat between shots, the latter searching for new ways to soothe his ever-calm nerves. And don’t try telling me that a quarter of a century has passed since Ernie won the US Open at Oakmont, or that it’s 18 years since the Goose won the same title at Southern Hills. We have new heroes now, and there will come a time when the twentysomethings of today will deny that Louis Oosthuizen and Charl Schwartzel are ready to peg it up with the ou toppies on the Champions Tour. But it will surely happen and they will be as certain as I that time is an illusion. When we look back at footage of their mighty deeds and then forward to today, we can see the corrosive effects of age, but still we expect them to hit the ball as far and putt as certainly as they did in their clear-eyed youth. And, let’s face it, if that were not the case why would anyone watch the Champions Tour at all? Some people are born old and others seem as immune to the ageing process as Dorian Gray. Changing sports, Sir Bobby Charlton looks the same today as he did when I first saw him play for England in 1970. During that time period, his Manchester United colleague, George Best, became a bloated old drunkard with someone else’s liver. It was almost impossible to look at George in his last years and believe it was the same man who could make a soccer ball talk. Yet Bobby, 14 years after George popped his clogs at the ridiculously early age of 59, still looks like he could lace up his boots and belt another free kick into the top corner of the net. Because of what I do for a living, I am getting used to the span of a career. These days, in rugby you are likely to be on the television while still at school, and if you are lucky enough to stay relatively injury-free, you might play professionally until the age of 35. So, about 17 years in the public eye; after that leave your hat at the door and thanks for coming. That’s where golf is different. If you are good enough, you can earn a living from the game from the moment you leave the amateur ranks until… well… you’ve had enough. Ernie and the Goose, I’m happy to say, are showing no signs of slowing down. Enjoy the forward tees and benevolent pin positions, boys. – Andy Capostagno is a monthly columnist for Compleat Golfer, where he represents the hackers. This column first appeared in the March issue of Compleat Golfer, now on sale.